I spent Thanksgiving of 2010 in the Ozark region of Missouri. As far as The Mark Twain National Forest goes, I give it a solid two thumbs up for scenery and pleasant smelling outdoor freshness. If you think though, that taking a scenic drive south through the forest on HWY 17 will get you to your destination in time for dinner, think twice. You’ll be on the road past dark and by then, you will no longer see the scenery, and half the time, may not even be sure where the road in front of you is. Yes, it’s that dark there. So be warned if you choose that particular route: embrace the confusion, or stick to the bigger roads. Or leave earlier in the day. I went there to visit the home of one of my dearest friends, a woman I met during my brief time in San Francisco. Diana moved from the big city of San Francisco to buy 80 acres of untamed Ozark land and start Sam’s Icelandic Sheep Farm. (Sam is how we met, by the way.) Yes, there are Icelandic Sheep on her farm, and lots of other critters. I encourage you to go to the farm’s website and take a look at it. 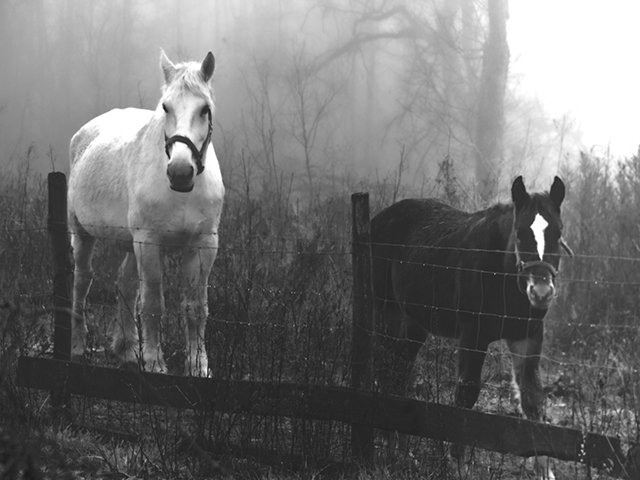 In this photo you meet Lady (The big white horse) and Hickory (the black pony). They are very gentle horses, quite comfortable with human contact. You know what’s really interesting? The land that Diana bought was au natural, as they say. She needed some trees cleared to make the farm function. Enter big horses to do some logging in a sustainable way. Enter also Ira King, a wonderful man who trained horses, worked with them, and helped Diana log a large portion of her land using the horses. It was an absolute treat to watch this work being done, and the appreciation for the animals and the land was evident in the process and the ‘horse whisperer’. As far as lumberjacks go, Ira was the first I ever met.